Recently i have created a mobile website using Drupal. I would like to use another theme instead of the mobile theme in certain pages such as the user login page. This can be done by the ThemeKey module. 1. Instead and enable ThemeKey. Advanced Forum has some default themes which are located @ sites/all/modules/advanced_forum/styles/<theme>. Naked/Naked Stacked themes could be used for customization. So copy the .tpl.php which you want to customize in the sites/all/modules/advanced_forum/styles/naked folder to your theme folder. For example, i want to customize the advanced-forum.naked.author-pane.tpl.php. For example, the machine name of Article is article. So the file name should be comment–node-article.tpl.php. I am now working a new website project which includes a forum. 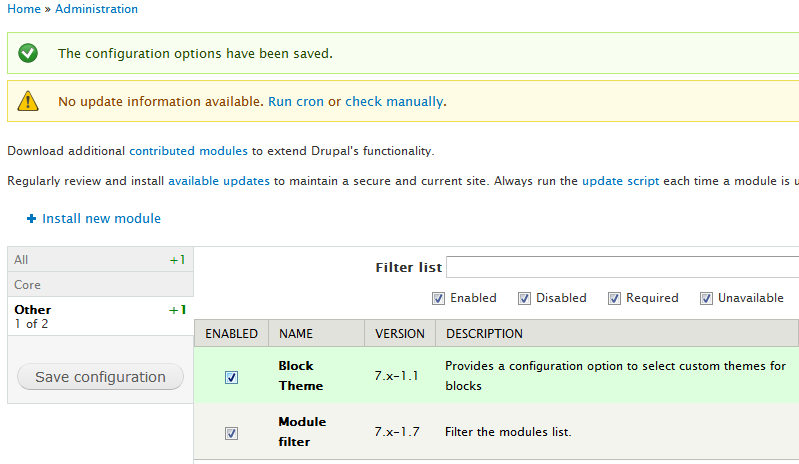 With the Forum module bundled in the Drupal core. It is easy to build a forum based Drupal site. In the coming days, i would like to share suggestions when working on forum site. First of all, you could equip your Drupal website with the basic forum features by enabling the core Forum module. However, that may be not enough for meeting the client’s requirements or it is difficult to customize it. That’s why we need the Advanced Forum module. If you want to customize the block.tpl.php for different blocks. The Block Theme module could serve this purpose well. 1. Download and enable the module. We can make the section-footer sticky in Omega theme by adding the following piece of code in <your-theme>-alpha-default.css. Reference: Has anyone tried to get a sticky footer to work with Omega?